The Crystal adjustable cartridge grips for the Cheyenne Hawk is the solution for every artist that wants to use disposable grips. 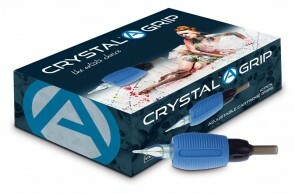 The Crystal Cartridge grips have the possibility to adjust the deepness of the needle. The needle modules can be replaced just like you are used to. Every grip is packed in a sterile package and have a long expiration date.